HomeArticleRestaurantsIs Bali The Food Capital Of Indonesia? ‘paradise’ does not only encompass the extensive range of jaw-dropping beaches and stunning beach lounges that you can get on the island. In fact, Bali is Indonesia’s very own paradise of food. t, we can now find almost every delicious cuisine from around the world on a single island. When you’re talking about Bali’s culinary scene, you know ‘unique’ is the middle name. 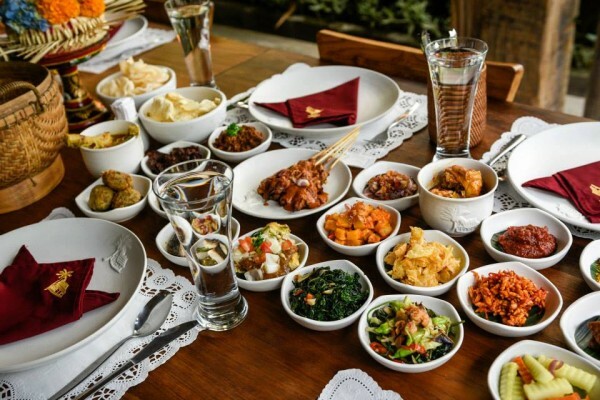 You should not expect to have mainstream food when in Bali, because it is basically stuffed with the most uncommon dishes and restaurants you’ll ever come across. To illustrate, some of the European dishes served in Bali are even created in the most unique way–by using Balinese local ingredients. How does that taste like? No doubt, it’s out of this world! Should we start from the most popular local dish, it would be Bali’s one and only roasted suckling pig. You can almost find this tasty dish everywhere across Bali. 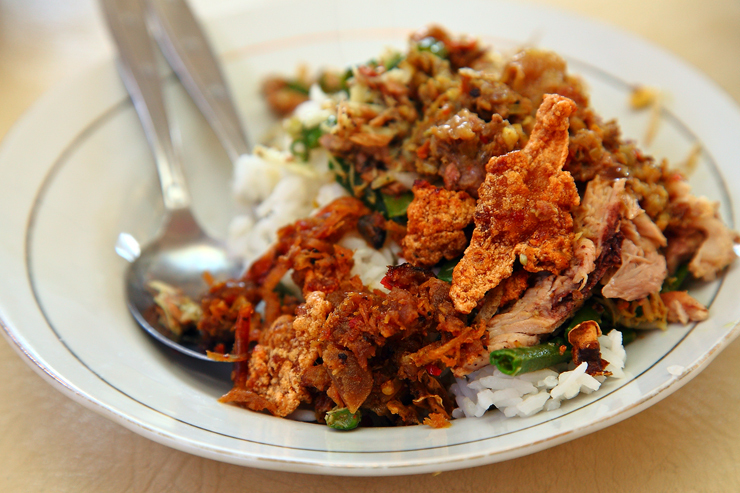 One bite of the crispy and tender suckling pig, and you’ll get to taste the authentic flavors of Bali that you can’t find anywhere else, even in Jakarta. One plate of Nasi Babi Guling usually includes white rice, crispy pork skin, pork meat slices, pork liver, pork satay, and mixed veggies. Sambal is mandatory. Some of the most popular ones are Babi Guling Pak Dobiel and Babi Guling Pak Malen. 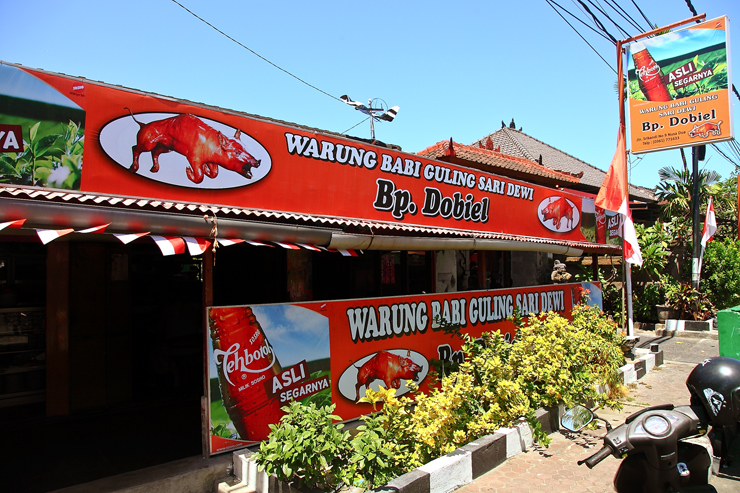 Babi Guling Pak Dobiel is a warung-type place, and it is located in Nusa Dua, just a few kilometers away from The Mulia Bali. It is arguably easy to find. Other than the place, how they serve the food is also similar to those in most warungs. Don’t expect a neat plating. But, hey, that’s exactly how we want it to be, right? This Babi Guling place is never not crowded, mostly by local tourists. I personally love the crispy pork skin the most here. It smacks your tongue in the best way possible! And when you dip the pork crackling to the hot pork soup… It’s just a taste you won’t ever forget. Bali is definitely like no other. It is the only place where you can enjoy warung-style food accompanied by a charming interior and a gorgeous view. When in Bali, you have the privilege to enjoy a plate of mouthwatering Nasi Campur while indulging yourself in the most beautiful view of rice paddies. This memorable experience can be made at NOOK Bali. When a beach view gets you bored already, you can switch a little and have a different kind of dining experience right here. The tropical wind breeze will hit your face gently, just the perfect ambience to enjoy your fresh juice while waiting for your food to be served. Of course, have a taste of their infamous Nasi Campur, which consists of white rice, chicken, corn fritters, sate Bali, Balado egg, and lots more. Simply the best way to start your summer day right. How the opening of new restaurants in Bali by a bunch of renowned chefs has been extremely trending also adds up to the reason why we think Bali is Indonesia’s new food capital. Let’s begin from one of the most celebrated ones, Jamie’s Italian. This world’s famous restaurant is opening in Bali, and it is located at the heart of the most tourist-crowded districts on the island, Kuta. Jamie Oliver and his team are serving authentic, beautiful Italian dishes made out of local Balinese ingredients. It is surely one of the most awaited openings this season! While Jamie’s Italian has just recently opened, Will Meyrick, a Scottish chef who has traveled to Cambodia, Laos, and Vietnam, also got interested with the culinary scene in Bali, which’s why he opened Mama San. It’s been a while since Mama San’s opening in Bali, yet the restaurant continues to become one of the most favored ones. The interior of the place incorporates the retro atmosphere of the colonial period in Shanghai, with a touch of modern twist. Talking about the food, the team at Mama San has beautifully crafted a broad range of Asian cuisines using authentic ingredients like no other. We have Italian and Asian cuisines on the list, and of course, not being left out, now it’s turn for the French. Chef Chris Salans, a French-American renowned chef, opened this establishment because of his love of Bali, its culinary scene, and its local spices. Mozaic Restaurant remains as one of the best restaurants in Bali that blends traditional Balinese ingredients and French techniques. Unique dishes, such as Javanese quail and foie gras pastille with Balinese rujak sauce, will surely deliver a one-of-a-kind dining experience. The romantic candle-lit atmosphere that’s situated in a garden will make you feel dreamy. Not being left out, of course, restaurants with breathtaking views. It makes sense why Bali remains as a popular place for restaurateurs for new establishments. 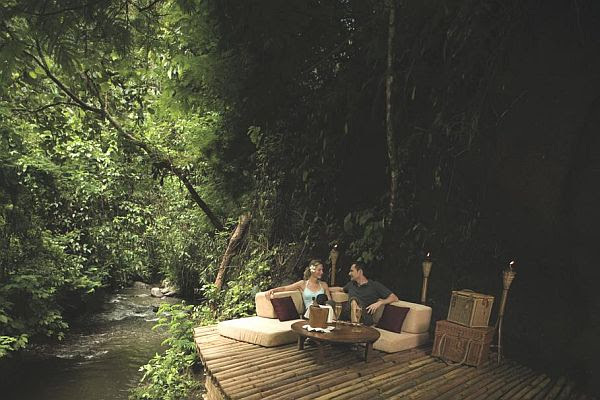 Mountain views, beach views, forest views… Bali basically has everything to meet their desires. Kudos to those who have made use of the Balinese natural beauty perfectly while serving legitimately scrumptious meals at the same time, such as The Restaurant at Hanging Gardens Ubud, with a jaw-dropping forest and rice paddies view that can’t be found anywhere else. Not forgetting the spectacular ocean view from di Mare Restaurant at Karma Kandara Resorts. Their breakfast selection is mouthwatering and the good news is that most of them are healthy and organic. Suitable for all–breakfast, lunch, and dinner. It is definitely the best place ever to watch the sun set with your loved one. Care for some astonishing mountain view? CasCades Restaurant at Viceroy Ubud has the answer to all your dreams. This view makes me forget all of my worries. Sounds cliche, but true. From local street food to upscale restaurants run by renowned chefs, as you can see, Bali is totally a food paradise, not only for the locals, but also for tourists and veterans. What makes it even better is that the fact that the society in Bali is aware that food is a truly celebrated element in Bali, which is why there have been several food events on the island. One of them is Ubud Food Festival 2015, which took place from June 5th to June 7th, 2015. The event featured various speakers from all over the world, including Indonesia’s food critiques, chefs, and international celebrity chefs. Programs, such as cooking demonstrations, food forums, workshops, and markets, brought together foodies from different cultures, and allowed them to embark on a fascinating food journey through the event. It gets even more exciting each year for foodies slash restaurateurs, because of the existence of Food, Hotel & Tourism Bali. This event provides opportunities to meet new customers and rekindle with old customers, as it provides spaces for those who want to exhibit their businesses and gain brand awareness. There are even some fun competitions, such as Latte Art Competition! As you might already know, the business of coffee shops keeps accelerating. This is a brilliant opportunity for coffee addicts to learn and win! Other than everything mentioned above, there’s still a lot more reasons to why Bali is the food capital of Indonesia. It will make a total sense when you get to step your feet on the island itself. Its vibrant and diverse culinary experience just keeps attracting more and more tourists every year, and it’s indeed safe to call Bali the Island of Paradise. Proud that Bali has such exquisite nickname, and it makes us even prouder that Bali has always lived up to its name. The post Is Bali The Food Capital Of Indonesia? appeared first on Qraved Journal.